April is National Stress Awareness month in the UK and, to mark it, in this blog we take a moment to remind ourselves that the medical professionals who take care of us and our loved ones daily, also need to be mindful of their health too. It’s no secret that being a doctor is a rewarding-yet-stressful job and it can be a challenge to maintain positive energy throughout and after a busy shift. Standing in as a replacement for unfilled sessions, along with IT issues in a practice, are just a few examples of stress sources. Along with possible financial pressures and lack of peer support, it is no surprise that your job can rapidly overwhelm your day-to-day life. These stresses, if left unmanaged, can carry severe consequences for physicians both professionally and personally. Therefore, it is important to recognise the signs early on, and find ways to deal with stress in order to get back on track at work. Unfortunately, there’s no simple ‘one-size-fits-all’ approach to something as complex as psychological stress, but there are ways to manage those levels before they become too much – as the following tips, documented by medical professionals, will show. This is something that healthcare professionals learn early on in their career, but don’t always apply to themselves. 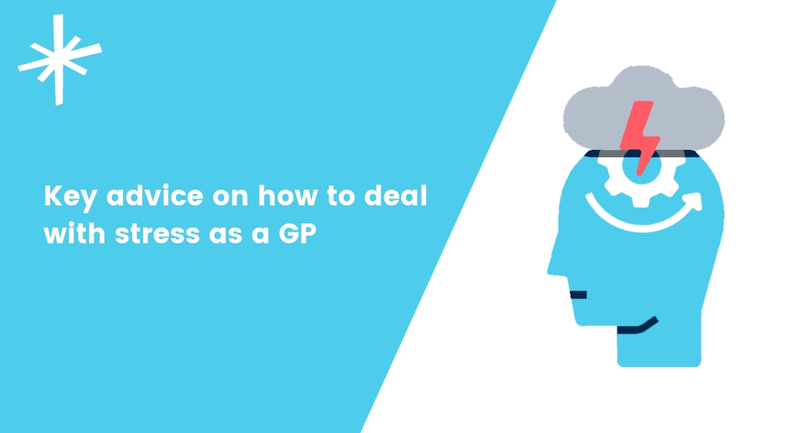 It’s an unnatural act for many, but GPs need to separate themselves from emotionally challenging situations with patients. It should be clear though, we aren’t suggesting that you turn off your emotions or ignore the plight of your patients, but instead - to detach yourself from your patient’s issues outside of the examination room. This both helps you to focus on the diagnosis of your patient when needed, and define a separation between your doctor life and personal life. It’s easier to say than do but try to stay positive! If you are having a particularly stressful day or week, try to take a short break, grab some air, take a few deep breaths and try to remember the big picture; why did you chose this vocation? The answer is usually simple one: to help people and make a genuine, positive difference to lives. That small piece of perspective will usually help clear your mind and allow you to focus on the job at hand once more. Let’s face it, clinicians are known perfectionists, especially when your job requires such complex effort, but at the end of the day, you are only human, and you must learn to put less pressure on yourself. Just like in every other profession, you are prone to making mistakes, but when someone’s wellness is in your hands, the demand to be faultless can be harder to deal with. If you ever do make a mistake, don’t ignore it, take time to understand it, learn from it and then forgive yourself. You’ll feel much better for it. Dedicate yourself some me-time, even if that means just short pause between sessions. It is essential to use your personal space to unwind and allow your brain to rest. Although seeing back-to-back patients can feel mundane at times, maintaining a personal hobby outside of work, can truly help sharpen your focus, bring excitement to your routine and sustain your happiness levels. Don’t be afraid to try new relaxation methods such as yoga, or even downloading a mindfulness app, such as NHS-approved Be Mindful. Prescribe yourself some sleep as you would to your recovering patients! Lack of sleep will only worsen your ability to handle the workload and induce more irritation. Check out our blog on GP sleep management for further tips on regulating your sleep cycle and ways to increase efficiency throughout the day! Stick to a balanced meal plan and make sure you attend regular workouts, regardless of how busy you are at the practice. Developing these good habits will help clear negative feelings and reduce some of the emotional intensity you’re experiencing. You know what they say? Doctors make the worst patients. It’s easy to forget that you might need help too. If your stress levels are particularly high, it’s good to open up to someone. Often colleagues can offer an outlet for you to express any concerns, or just to talk about what is troubling you. Even a casual conversation about your day has its benefits – you will soon realise that you are not alone, and gain an alternate insight to the way you are feeling. Developed by Dr. Evangelia Demerouti, the Oldenburg Burnout Inventory (OLBI) examines the relationships between burnout and short-term consequences of mental strain within and outside human services professions, such as healthcare. The BMA has created a confidential Burnout Questionnaire based on the Oldenburg Burnout Inventory, which you can use to help you screen yourself for symptoms of burnout and get a feel for whether you might be vulnerable to burnout. Factors contributing to burnout include excessive workloads, patients pressures, lack of control, interference from managers, insecurity, reorganisation, poor support, front-line practice, perceived threats of complaints or violence and dysfunctional workplaces. You can find the questionnaire, here. If you are a healthcare professional looking for support on your physical or mental health, you can find further, professional advice at the NHS Practitioner Health Programme (rated 'Outstanding' by the CQC) and at GP Health Service. For any GPs feeling the strain of the day, we hope these bits of advice will help. If you are looking for more guidance and professional advice, for all aspects of your career, you can find it on our blog, here. Searching for new ways to get organised and defeat staffing inefficiency? Lantum is a workforce platform that help GPs with all aspects of finding work and getting paid fast. For any bank or locum GPs looking for further help managing their work schedule and reduce admin time, Locum Organiser is a toolkit to organise locum life, organise your diary and complete your tax return and pension.